Looking to the future of space exploration, there really is no question that it will involve a growing human presence in Low Earth Orbit (LEO). This will include not only successors to the International Space Station, but most likely commercial habitats and facilities. These will not only allow for ventures like space tourism, but will also facilitate missions that take us back to the Moon, to Mars, and even beyond. With this purpose in mind, an interdisciplinary team of MIT graduate students designed a space habitat known as the Managed, Reconfigurable, In-space Nodal Assembly (MARINA). This module would serve as an privately-owned space station that would be occupied by two anchor-tenants for a period of ten years; a luxury hotel that would provide orbital accommodations, and NASA. For their invention, the team won first prize in the graduate division of the Revolutionary Aerospace Systems Concepts-Academic Linkage Design Competition Forum (RASC-AL), a yearlong graduate-level competition hosted by NASA. This challenge involved designing a commercial module for use in low Earth orbit that could also serve as a Mars transit vehicle in the future. Since 2002, RASC-AL competitions have sought to engage university students and advisors for the purpose of coming up with ideas that could enhancing future NASA missions. For this year’s competition, NASA asked teams to develop human spaceflight concepts that focused on operations in cislunar space – i.e. in, around, and beyond the Moon – that could also facilitate their proposed “Journey to Mars” by the 2030s. Specifically, they were tasked with finding ways to leverage innovations and new technologies to improve humanity’s ability to work more effectively in microgravity. With this in mind, the themes for this year’s competition ranged from from the design of more efficient subsystems to the development of architectures that support NASA’s goal of extending humanity’s reach into space. Led by Matthew Moraguez, a graduate student at MIT’s Department of Aeronautics and Astronautics (AeroAstro) and a member of the Strategic Engineering Research Group (SERG), the MIT team focused on the theme of creating a Commercially Enabled LEO Habitat Module. Their concept, which incorporates lessons that have been learned from the ISS, was designed with the needs of both the private and public space sectors in mind. To meet their goals for the competition , the team came up with a modular design for MARINA that featured several key innovations. These included extensions to the International Docking System Standard (IDSS) interface (used aboard the ISS), modular architecture, and a distribution of subsystem functions throughout these modules. As Moraguez explained, their design will allow for some wide-ranging opportunities. Another important benefit comes in the form of cost-savings. According to NASA estimates, the recurring cost of MARINA will be about $360 million per year, which represents a significant reduction over the current costs of maintaining and operating the ISS. In total, it would offer NASA a savings of about $3 billion per year, which is approximately 16% of the agency’s annual budget. Other commercial features include serviced berths that would be rented out to accommodate customer-owned modules. This goes for the station’s interior modularized rack space as well, where smaller companies that provide contract services to on-board occupants would be able to rent out space. Would it be too much to ask that it also has robot butlers? The RASCAL competition began in August of 2016 in Cocoa Beach, Florida, and concluded on June 2nd, 2017. The top overall honors were awarded to the teams from Virginia Tech and the University of Maryland for their space habitat concepts, known as Project Theseus and Ultima Thule, respectively. When Will We Send Astronauts to Mars? History was made on July 20th, 1969, when Apollo 11 astronauts Neil Armstrong and Buzz Aldrin set foot on the surface of the Moon. The moment was the culmination of decades of hard work, research, development and sacrifice. And since that time, human beings have been waiting and wondering when we might achieve the next great astronomical milestone. So really, when will we see a man or woman set foot on Mars? The prospect has been talked about for decades, back when NASA and the Soviets were still planning on setting foot on the Moon. It is the next logical step, after all. And at present, several plans are in development that could be coming to fruition in just a few decades time. Werner Von Braun, the (in)famous former Nazi rocket scientist – and the man who helped spearhead NASA’s Project Mercury – was actually the first to develop a concept for a crewed mission to Mars. Titled The Mars Project (1952), his proposal called for ten spacecraft (7 passenger, 3 cargo) that would transport a crew of 70 astronauts to Mars. His proposal was based in part on the large Antarctic expedition known as Operation Highjump (1946–1947), a US Navy program which took place a few years before he started penning his treatise. The plan called for the construction of the interplanetary spacecraft in around the Earth using a series of reusable space shuttles. He also believed that, given the current pace of space exploration, such a mission could be mounted by 1965 (later revised to 1980) and would spend the next three years making the round trip mission. Once in Mars orbit, the crew would use telescopes to find a suitable site for their base camp near the equator. A landing crew would then descend using a series of detachable winged aircraft (with ski landing struts) and glide down to land on the polar ice caps. A skeleton crew would remain with the ships in orbit as the surface crew would then travel 6,500 km overland using crawlers to the identified base camp site. They would then build a landing strip which would allow the rest of the crew to descend from orbit in wheeled gliders. After spending a total of 443 days on Mars conducting surveys and research, the crew would use these same gliders as ascent craft to return to the mother ships. Von Braun not only calculated the size and weight of each ship, but also how much fuel each would require for the round trip. He also computed the rocket burns necessary to perform the required maneuvers. Because of the detailed nature, calculations and planning in his proposal, The Mars Project remains one of the most influential books on human missions to the Red Planet. Obviously, such a mission didn’t happen by 1965 (or 1980 for that matter). In fact, humans didn’t even return to the Moon after Eugene Cernan climbed out of the Apollo 17 capsule in 1972. With the winding down of the Space Race and the costs of sending astronauts to the Moon, plans to explore Mars were placed on the backburner until the last decade of the 20th century. In 1990, a proposal called Mars Direct was developed by Robert Zubrin, founder of the Mars Society and fellow aerospace engineer David Baker. This plan envisioned a series of cost-effective mission to Mars using current technology, with the ultimate goal of colonization. The initial missions would involve crews landing on the surface and leaving behind hab-structures, thus making subsequent missions easier to undertake. In time, the surface habs would give way to subsurface pressurized habitats built from locally-produced Martian brick. This would represent a first step in the development of in-situ resource utilization, and eventual human settlement. During and after this initial phase of habitat construction, hard-plastic radiation- and abrasion-resistant geodesic domes would be deployed to the surface for eventual habitation and crop growth. Local industries would begin to grow using indigenous resources, which would center around the manufacture of plastics, ceramics and glass out of Martian soil, sand and hydrocarbons. While Zubrin acknowledged that Martian colonists would be partially Earth-dependent for centuries, he also stated that a Mars colony would also be able to create a viable economy. For one, Mars has large concentrations of precious metals that have not been subjected to millennia of human extracting. Second, the concentration of deuterium – a possible source for rocket fuel and nuclear fusion – is five times greater on Mars. In 1993, NASA adopted a version of this plan for their “Mars Design Reference” mission, which went through five iterations between 1993 and 2009. And while it involved a great deal of thinking and planning, it failed to come up with any specific hardware or projects. Things changed in the 21st century after two presidential administrations made fateful decisions regarding NASA. The first came in 2004 when President George W. Bush announced the “Vision for Space Exploration“. This involved retiring the Space Shuttle and developing a new class of launchers that could take humans back to the Moon by 2020 – known as the Constellation Program. Then, in February of 2010, the Obama administration announced that it was cancelling the Constellation Program and passed the Authorization Act of 2010. Intrinsic to this plan was a Mars Direct mission concept, which called for the development of the necessary equipment and systems to mount a crewed mission to Mars by the 2030s. In 2015, NASA’s Human Exploration and Operations Mission Directorate (HEOMD) presented the “Evolvable Mars Campaign”, which outlined their plans for their “Journey to Mars’ by the 2030s. Intrinsic to this plan was the use of the new Orion Multi-Purpose Crew Vehicle (MPCV) and the Space Launch System (SLS). The proposed journey would involve Three Phases, which would involve a total of 32 SLS launches between 2018 and the 2030s. These missions would send all the necessary components to cis-lunar space and then onto near-Mars space before making crewed landings onto the surface. Phase One (the “Earth Reliant Phase”) calls for long-term studies aboard the ISS until 2024, as well as testing the SLS and Orion Crew capsule. Currently, this involves the planned launch of Exploration Mission 1 (EM-1) in Sept. of 2018, which will be the first flight of the SLS and the second uncrewed test flight of the Orion spacecraft. NASA also plans to capture a near=Earth asteroid and bring it into lunar orbit, as a means of testing the capabilities and equipment for a Mars mission. Known as the Asteroid Redirect Mission, this mission is scheduled to take place in the 2020s and would primarily involve a robotic mission towing the asteroid and returning samples. Exploration Mission 2 (EM-2), the first crewed flight using the Orion capsule, would conduct a flyby around the Moon and this asteroid between 2021 and 2023. 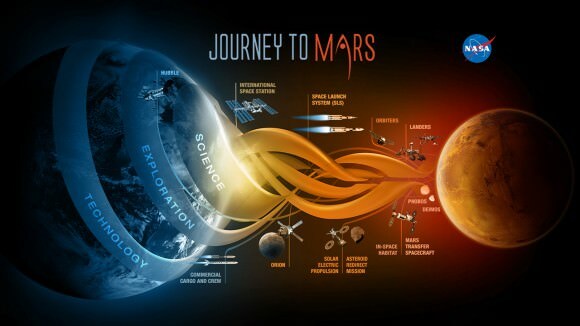 At this point, NASA would be moving into Phase Two (“Proving Ground”) of the Journey to Mars, where the focus would move away from Earth and into cis-lunar space. Multiple SLS launches would deliver the mission components during this time – including a habitat that would eventually be transported to Martian orbit, landing craft, and exploration vehicles for the surface of Mars. This phase also calls for the testing of key technologies, like Solar Electric Propulsion (aka. the ion engine). By the early 2030s, Phase Three (“Earth Independent”) would begin. This calls for testing the entry, descent and landing techniques needed to get to the Martian surface, and the development of in-situ resource utilization. It also calls for the transferring of all mission components (and an exploration crew) to Martian orbit, from which the crews would eventually mount missions to designated “Exploration Zones” on the surface. On Sept. 15th, 2016, the Senate Committee on Commerce, Science, and Transportation passed the NASA Transition Authorization Act of 2016, a measure designed to ensure short-term stability for the agency in the coming year. The European Space Agency (ESA) has long-term plans to send humans to Mars, though they have yet to build a manned spacecraft. As part of the Aurora Program, this would involve a crewed mission to Mars in the 2030s using an Ariane M rocket. Other key points along that timeline include the ExoMars rover (2016-2020), a crewed mission to the Moon in 2024, and an automated mission to Mars in 2026. Roscosmos, the Russian Federal Space Agency, is also planning a crewed mission to Mars, but doesn’t envision it happening until between 2040 and 2060. In the meantime, they have conducted simulations (called Mars-500), which wrapped up in Russia back in 2011. The Chinese space agency similarly has plans to mount a crewed mission to Mars between 2040 and 2060, but only after crewed missions to Mars take place. In 2012, a group of Dutch entrepreneurs revealed plans for a crowdfunded campaign to establish a human Mars base, beginning in 2023. Known as MarsOne, the plan calls for a series of one-way missions to establish a permanent and expanding colony on Mars, which would be financed with the help of media participation. Other details of the MarsOne plan include sending a telecom orbiter by 2018, a rover in 2020, and the base components and its settlers by 2023. The base would be powered by 3,000 square meters of solar panels and the SpaceX Falcon 9 Heavy rocket would be used to launch the hardware. The first crew of 4 astronauts would land on Mars in 2025; then, every two years, a new crew of 4 astronauts would arrive. SpaceX and Tesla CEO Elon Musk has also announced plans to establish a colony on Mars in the coming decades. Intrinsic to this plan is the development of the Mars Colonial Transporter (MCT), a spaceflight system that would rely of reusable rocket engines, launch vehicles and space capsules to transport humans to Mars and return to Earth. As of 2014, SpaceX has begun development of the large Raptor rocket engine for the Mars Colonial Transporter, and a successful test was announced in September of 2016. In January 2015, Musk said that he hoped to release details of the “completely new architecture” for the Mars transport system in late 2015. In June 2016, Musk stated in the first unmanned flight of the MCT spacecraft would take place in 2022, followed by the first manned MCT Mars flight departing in 2024. In September 2016, during the 2016 International Astronautical Congress, Musk revealed further details of his plan, which included the design for an Interplanetary Transport System (ITS) – an upgraded version of the MCT. According to Musk’s estimates, the ITS would cost $10 billion to develop and would be ready to ferry the first passengers to Mars as early as 2024. Each of the SpaceX vehicles would accommodate 100 passengers, with trips being made every 26 months (when Earth and Mars are closest). Musk also estimated that tickets would cost $500,000 per person, but would later drop to a third of that. And while some people might have a hard time thinking of MarsOne’s volunteers or SpaceX’s passengers as astronauts, they would nevertheless be human beings setting foot on the Red Planet. And if they should make it there before any crewed missions by a federal space agency, are we really going to split hairs? So the question remains, when will see people sent to Mars? The answer is, assuming all goes well, sometime in the next two decades. And while there are plenty who doubt the legitimacy of recent proposals, or the timetables they include, the fact that we are speaking about going to Mars a very real possibility shows just how far we’ve come since the Apollo era. We’ve written many articles about humans traveling to Mars. Here’s how new technology might slash the time to travel to Mars down to 39 days, and here’s an article about a team that did a simulated Mars mission. If you’d like more information about humans traveling to Mars, check out the Mars Society’s homepage. And here’s a link to MarsDrive, and another group looking to send people to Mars. The rumors were true, Constellation is cancelled. No Ares 1 crew vehicle, no Ares V heavy lifter, no Altair lander. No bases on the Moon, and no human exploration of Mars. NASA is canceling the human return to the Moon. Obviously I’m a huge fan of human space exploration. I’ve dedicated my life to it. I’ve raised my children in the certainty that they’re going to be the first humans to set foot on the surface of Mars, and I mourn the end of the Apollo program. Where’s my flying car? But I’ve also felt deeply unsettled about the Constellation program. Maybe it was the best way to reach the Moon 40 years ago, but things are different now. As some of you know, my background is in software, where the competition is fierce. And half of this is a mental game; you win the information war in the minds of customers through FUD – Fear, Uncertainty and Doubt. Make your nervous customers wait, and hope that your next great solution is going to solve all their problems. Although we’re talking space exploration here, I see a parallel. Why work our tails off to go to the Moon or Mars if NASA is going to just make it happen for us? Well they aren’t, and I’d argue that they never were. It was just a matter of time before the political parties changed, budgets tightened, and priorities shifted. It was inevitable that this would happen, and if it didn’t happen this time around, it would happen with the next shift in government. No long term goal could ever survive. And time spent waiting for NASA to make it happen was wasted time. As the guy watching stats at Universe Today (2 million readers in January, 2009), I can guarantee that interest in space and astronomy is continuing to rise. The demand and interest is there, and thanks to the Internet, thousands of flowers are blooming as space advocacy groups are coming together to get things done – like the Mars Society, and the Planetary Society. Private companies are making human space tourism a reality, with Virgin Galactic, Space Adventures, and Bigelow Aerospace. There are privately funded prizes available for the completion of technical accomplishments, like the Google Lunar X Prize. But with NASA handling that “back to the Moon” thing, space advocates probably thought they could relax a little. I think that NASA has an enormous role to play in human space exploration. They have the ability to solve problems that private enterprise just doesn’t have the funds for. Sure, NASA put a man on the Moon, but it’s the trickle down technologies that we appreciate every day. Like velcro! NASA needs create the tools and technology that will enable a vibrant and healthy private space industry. What’s the best way to extract fuel from an asteroid? How can ion engines cut down flight times? Is there a better way to make a spacesuit? What are some good materials for space elevators? What are some safer rocket fuels? How can we make rocket launches better for the environment? Is there a way to make velcro better? They can do this through pure research, competitions, university grants, prizes, and private/government partnerships. They can team up with other governments to cut costs on the really big challenges. And you know what’s strange? They already do this with science. NASA listens to scientists to hear their greatest challenges. “We need to see through gas and dust to see star formation and protoplanetary disks” – here’s Spitzer. “We need to see high energy regions around supermassive black holes” – that’s Fermi. “We need to know if there’s evidence of water on the surface of Mars” – that’s Spirit and Opportunity. 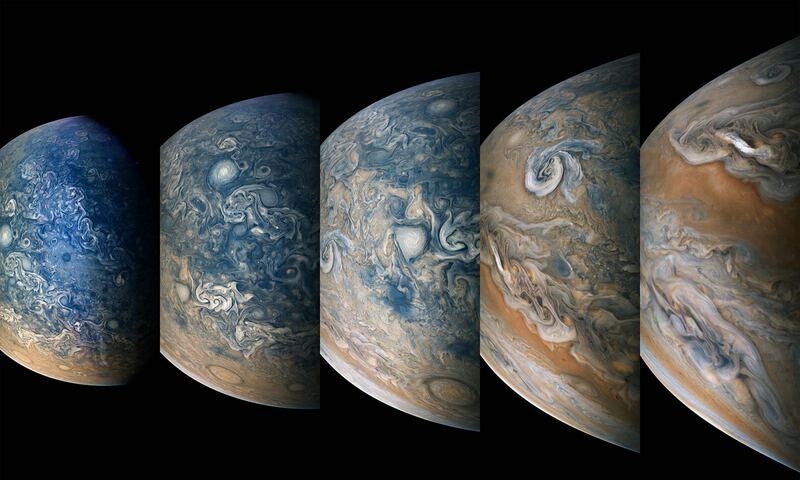 NASA does this so well with science? Why don’t they answer questions and solve problems in the same way for space exploration? There are so many questions, and NASA can help point us in the right directions. NASA can help me build my flying car, but I still want to choose the destination. Don’t worry, the Moon is still there, and Mars isn’t going anywhere. And my daughter is still going to be first person to squish the sands of Mars between her toes (thanks to remote toe-sensing technology developed by NASA). Here’s an article about the 1st man on the Moon.